Jhoon Rhee during his daily morning workout in 2002, at age 70. Nobody will bother Jhoon Rhee again. If anybody ever did, that is. 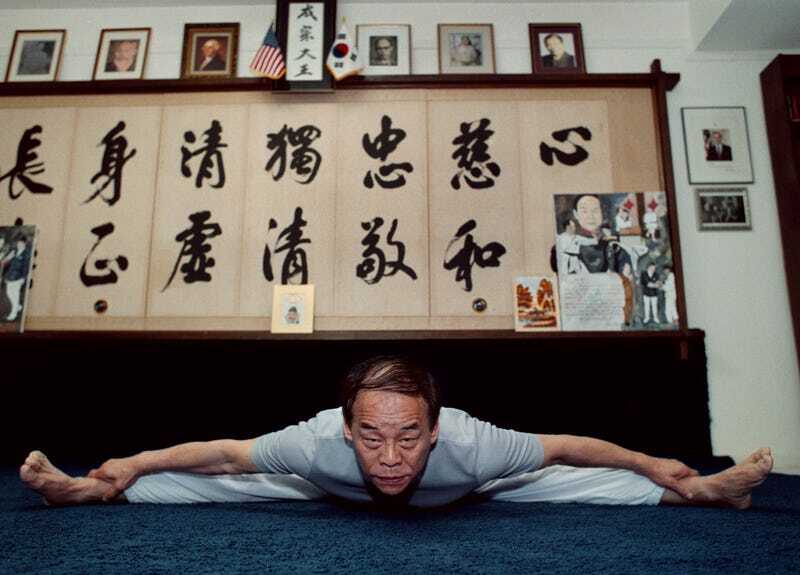 Rhee, a leading proponent of martial arts in the U.S. from the 1970s on, has died. The longtime resident of the Washington, D.C. area was 86 years old. Rhee, a Korean immigrant, taught self-defense to America’s power people, with a client list that included presidents (Lyndon Johnson and George H.W. Bush), speakers of the house (Newt Gingrich and near-miss Bob Livingston), movie icons (Bruce Lee, who Rhee said did not know how to throw a kick before their sessions together) and even a world heavyweight champion: He trained with Muhammad Ali at the fighter’s Deer Park, Pa., camp beginning in 1975, before his bout with Joe Frazier, dubbed the Thrilla in Manila. Ali said Rhee re-worked his jab into a combination of boxing and karate techniques, and dubbed the fusion the “Accu-Punch.” Ali claimed he used his new weapon to incapacitate Richard Dunn, the last knockout victim of his career. Rhee’s taekwondo schools thrived, in no small part because of the martial-arts boom sparked by Kung Fu, a television series starring David Carradine that aired on the ABC network from 1972 to 1975. And Rhee’s ads and theme song had incredible legs, even getting a nod from The Americans, a period-piece show where writers work overtime to get everything right about D.C. in the 1980s. Alas, he didn’t make his target age. But to generations of D.C. residents, Rhee seems utterly immortal.